Makers and developers that are looking to build NFC Arduino-based projects may be interested in a new development board for the KeyDuino that has been created by Pierre Charlier. 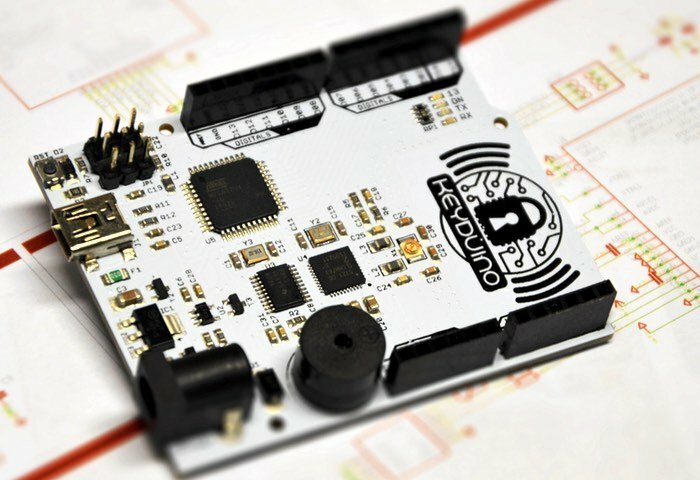 The KeyDuino has been designed to provide an easy way to build NFC projects and takes the form of an Arduino compatible development board with a built-in Near Field Communication module. Watch the video below to learn more about the inspiration behind the KeyDuino board from its creator. NFC or Near Field Communication is a standards-based short range wireless connectivity technology that enables making transactions, exchanging digital content or connecting electronic devices with a simple touch. NFC is compatible with hundreds of millions of smartphones, contactless cards and readers already deployed worldwide. The KeyDuino development board is Arduino Leonardo hardware (with a few exceptions, see Q/A) and software compatible. Since the KeyDuino is based on the Arduino Leonardo (ATMEGA32U4) all code that runs on an Arduino Leonardo can also run on a KeyDuino. For more information on the new KeyDuino jump over to the Kickstarter website for details and to make a pledge from €25 for early bird backers. If you making Arduino projects you may enjoy building your very own Arduino wind speed meter that requires just basic Arduino skills.